Clear Health Analytics | Do You Even Need Health Insurance Coverage? Read This Before Going Uninsured. Do You Even Need Health Insurance Coverage? Read This Before Going Uninsured. Sometimes the cost of health insurance leads Americans to risk going without it. A growing number of Americans are choosing to forgo health insurance coverage, instead finding other healthcare solutions or banking on their current good health. Why? Rising costs, which are projected to increase by at least 15% next year and 7% each year following (according to this source), are forcing an increasing number of U.S. citizens to make a hard choice. In fact, as measured by the CPS ASEC, over 28 million people, or 8.8%, didn’t have coverage at any point in 2017. 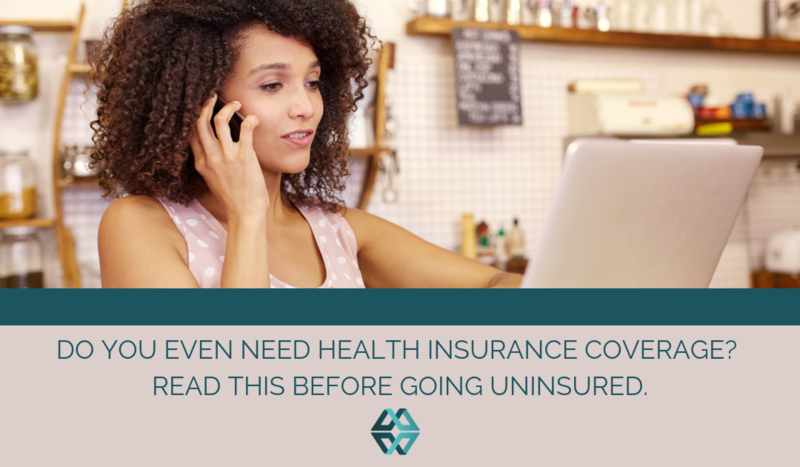 This article explores the alternatives to health insurance coverage, as well as the risks that are involved when you are uninsured. Rising premiums and deductibles seem to hit the hardest those who don’t qualify for subsidies and don’t have employer-sponsored coverage. The situations are unique, but the stories are similar: healthcare insurance costs rise beyond reasonable amounts meaning that tough choices have to be made. A growing number of primary care providers are starting to shift towards a monthly membership fee in a model called direct primary care provider (DPCP), which offers unlimited office visits, prescription drug discounts, and labs. 34% of provider offices surveyed say they plan to offer memberships in the next few years. Bloomberg, in a series of ongoing reports, talked to couples, families, and individuals about their choice to forgo health insurance and instead purchase alternative coverage. One couple pays $198 for their monthly membership but were paying nearly $1,700 in monthly insurance premiums before going uninsured. Another family interviewed by Bloomberg says that their group membership is the “best care we’ve ever had.” Critics are quick to note that these memberships don’t cover hospital or ER visits, certain diagnostic tests, and specialty treatments (like radiation). Health care sharing ministries offer a bill-paying model where an enrollee can share the expense of their medical bills with other like-minded individuals. These faith-based groups are a popular option for some, but critics point out there aren’t any guarantees for enrollees, and therefore your medical bills might not be paid at the same rate as traditional insurance. Health care sharing ministries are unregulated, and this makes them seem riskier to some. Savings plans are the choice for a few uninsured Americans, who prefer to stash away money and pay for medical care out of pocket. Many providers (even specialists) will give you a discount if you can pay your bill in full, up-front as long as you ask. It’s not an easy option for many, as a survey from The Federal Reserve revealed the 46% of Americans could not cover a $400 emergency expense. Medical tourism is another trend for some who need costly treatments. Writer Aurora Almendral discusses how her diagnosis of Graves disease while uninsured led her to seek some off-the-radar medical care. After her doctor told her she would need two tests before being able to get treated for her disease (an estimated cost of $3,000-$7,000), Almendral flew to the Philippines, where she had family and could receive both necessary tests for a total of $40. She estimates that her total trip – including airfare, additional doctors’ fees, and a trip to the beach – cost $2,200. Limited benefit plans offer individuals insurance coverage at a lower cost, which are often cheaper than the health care penalty tax that is still in effect this year. The plans do not require approval from state regulators because these short-term, limited benefits plans are “not insurance,” according to an employee at one plan provider. Often times, these “skinny” plans confuse enrollees, who may not realize how limited the benefits of the plans truly are. Searching through most healthcare exchanges does not adequately address a consumer’s personal medical needs or inform them of out of pocket costs for their plan options. If this information was more transparent and up front for consumers, insurance might seem like a viable option for them. The number of those who are uninsured is expected to rise by 3 million next year when the tax penalty for being without healthcare coverage is lifted. NPR reported earlier this year that the confusion over when the tax penalty would be lifted caused some to think they wouldn’t be penalized this year for not having health insurance. If this is you, you may be exempt from the penalty tax. It’s a big risk to go without health insurance coverage, but in many cases it’s a necessity for those that cannot afford costly insurance premiums. Some caution, however, that those who cobble together options and remain outside of the insurance market aren’t adequately prepared for emergency medical costs, which can be enormous (recent estimates from the Federal government quote a 3-day hospital stay at $30,000). That means that even a minor health issue could bankrupt the average household. It also means that without access to medical care, an individual may get sicker and end up with a more serious health condition than they would have had if they’d been able to receive preventive care. Going uninsured is a short-term plan for most. Many would prefer the comfort of knowing they could access medical care in a timely manner, and that sudden hospitalizations or costly treatments won’t bankrupt them. Healthcare costs are projected to rise as the Affordable Care Act is slowly repealed. Even with alternatives to insurance, is an affordable solution to healthcare in sight? Medical costs in America are among the highest in the world. The Economist addressed this in an issue dedicated entirely to universal healthcare, which they called “an affordable necessity.” As the blog HealthPopuli points out, one cannot look at universal healthcare as an end-all solution without also addressing financial inclusion (defined by the World Bank as access to useful and affordable financial products or services). Americans are risking their financial well-being by going without health insurance not because they want too, but because they cannot afford to do otherwise. Unfortunately, this may be a result of poor information. Searching through most healthcare exchanges does not adequately address a consumer’s personal medical needs or inform them of the out of pocket costs for their plan options.